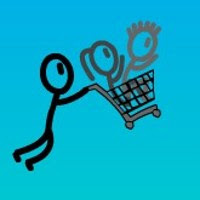 Shopping Cart Hero, developed by MonkeyWantBanana, is a graphically simple, but surprisingly addictive game centered on a truly fringe and extreme sporting event: shopping cart jumping. Like something you’d witness on the show Jackass, the event is akin to something drunk frat boys would cook up during a weekend bender. The stick-figure graphics are serviceable and charming in their minimalism, and the game mechanics and progression are fairly simple. Though not as polished as John Cooney’s Hedgehog Launch (which has very similar progression and mechanics), Shopping Cart Hero still does a good job compelling you to try and beat your best jump. Risking severe bodily harm for ultimate glory is rarely this much fun.